Background: Behavioral Finance seeks to explain the anomalous behavior of investors and markets that are not consistent with Modern Portfolio Theory's (MPT) presumption that investors are rational and markets are efficient. Daniel Kahneman and Amos Tversky are widely considered as the fathers of behavioral finance. Other significant contributors include Richard Thaler, Professor of Behavioral Science and Economics at the University of Chicago, and Robert Shiller, Professor of Economics at Yale University. Kahneman and Shiller have each received the Nobel Prize in Economics — in 2002 and 2013 respectively. Irrational exuberance is the iconic phrase used by Federal Reserve Board Chairman, Alan Greenspan, in a December 1996 speech given at the American Enterprise Institute as a warning that the market was likely overvalued. In 2000, Robert Shiller entitled his behavioral finance book Irrational Exuberance in reference to the underlying cause of market bubble formation. Irrational exuberance is at the very root of why rumors, fads, and trends exist — beliefs that feed on beliefs that feed on the beliefs. Since market bubbles are simply equities with superior price trends, then a trend-following system that holds only the trend leader from among a set of alternatives should do much better than Modern Portfolio Theory for capitalizing on market bubbles. Detecting the Bubble Early Enough. A quick survey of popular online technical investment tools reveals an almost singular focus on determining whether to buy, hold, or sell a particular equity based on technical/pattern indicators to determine the entry and exit points for each — one at a time — much like judging a solo contest. Conversely, as detailed in the AAII Seminar Video, a SectorSurfer Strategy is more like a horse race where the question is not, "Is my horse running fast today?" but rather, "Am I riding the fastest horse today?" Focusing on individual equity analysis inherently diverts attention from the bigger picture, and thwarts detection of other evolving equity price trends other than the relatively few an individual has the capacity to diligently monitor. However, this Portfolio and its underlying Strategies demonstrate that bubble formation in any of the 60 constituent equities will be inherently detected through its superior price trend. And, within SectorSurfer, trend leaders are always owned. Owning the Bubble Long Enough. Technical investment tools encourage leaving the party early — not letting profits run. First, disciplined pattern traders know never to enter a position without setting the exit point conditions — a sell price for both the upside and the downside. This short-term perspective guarantees a bubble will only be sampled, but never owned. Second, many popular indicators known as oscillators produce buy signals only during price trend acceleration, and revert to a neutral indication for longer term steady trends. Thus, oscillator indicators also guarantee that a bubble can only be sampled, but never owned. Third, as previously described, popular investment tools judge the bubble's trend as if it were a solo event rather than a horse race. Not only does this produce susceptibility to whipsaw losses, but it also produces sell signals related to market events that aren't associated with the bubble's trend leadership status. Thus, solo analysis inherently works against owning the bubble long enough. SectorSurfer's trend-following algorithms and horse race style analysis (differential signal processing) are free of these problems, allowing profits to run while it remains the trend leader. Not Owning the Bubble Too Long. Eventually all bubbles pop. Unfortunately, one cannot know that the pop has actually happened until some degree of loss from the peak has already occurred. Presuming that an investor should let profits run, then the task at hand is to promptly determine when the party actually is over in order to minimize profit reversal. It can be shown that the best exit from an aging bubble is for it to smoothly pass the baton of trend leadership to another related equity as the bubble's superior price trends wane. Again, it is the horse race model, rather than the solo contest model, that provides the desired functionality. While each of the Portfolio's five Strategies (see below) is focused on a different target market sector, the constituent funds in each Strategy were selected on the basis of (1) participating in the target market sector, but with some variation in focus from from the other funds to improve baton handoff reliability, and (2) acting as a performance backstop to prop up periods where the market sector is otherwise generally weak. Thus, when a bubble does develop, it will subsequently hand off the baton reliably when it loses its trend leadership status. "Own the Bubble" Performance Notes. Each of the five Strategies below graphically demonstrate execution of the above three principles required to Own the Bubble. It should not be surprising that achieving better performance requires new tools and new methods — and may require setting aside a few old beliefs and practices. When one graduates from using a club to using a sword, one must additionally learn to lunge, slice, and swing differently to get the maximum benefit from the sword. The Portfolio chart combines all five of the Strategies, a process we refer to as Post-Surfing Diversification, the final step of Tactical Diversification as described below. The primary benefit is best conveyed by the rectangular Risk/Return chart within the Portfolio chart which shows a significant reduction in overall Portfolio risk because the anomalous bumps of each Strategy are averaged together to produce a measurably more stable return. Finally, while the performance of the "Own the Bubble" Portfolio is quite good, an important compromise was made to better illustrate certain concepts. 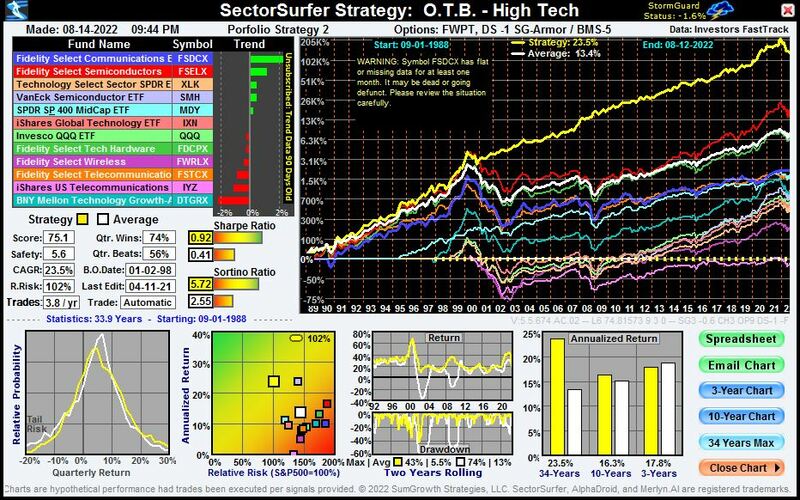 Generally, high performance True Sector Rotation Strategies integrate multiple sectors into a single Strategy to capture a broader range of bubbles and further improve Strategy returns. See Fidelity Portfolio Strategies here. Tactical Diversification was specifically developed to improve portfolio performance during both bull and bear markets. While we must endure punctuated events that shock the market unpredictably, punctuated events do lead to new trends that can be profitably employed. It is Tactical Diversification's sequential application of three distinct types of diversification that produce the superb performance of this model portfolio. Tactical Diversification overcomes the inherent shortcomings of Modern Portfolio Theory (MPT), Dynamic Asset Allocation (DAA) and Tactical Asset Allocation (TAA), all of which utilize simple diversification to reduce risk, but at the expense of producing only near average returns. To achieve a different result requires a different approach. • Funds: Equity diversification: owning multiple stocks or bonds to reduce risks associated with individual equities. 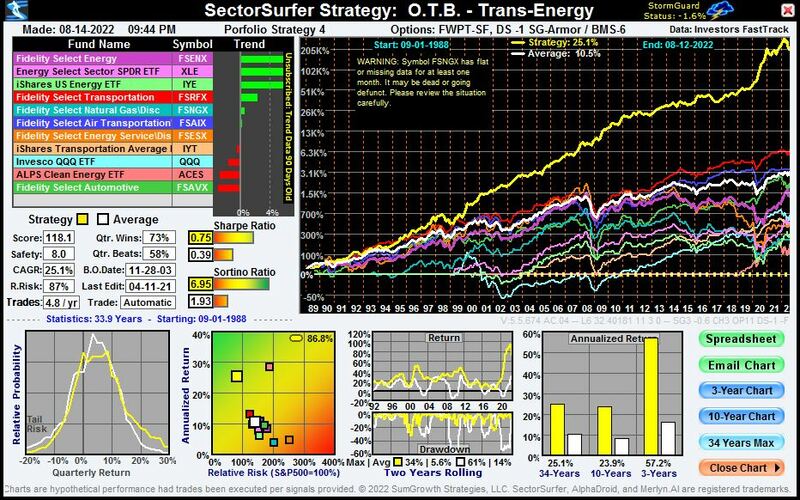 • Strategy: Serial diversification: owning multiple funds, but only one at a time — the one designated as trend leader. 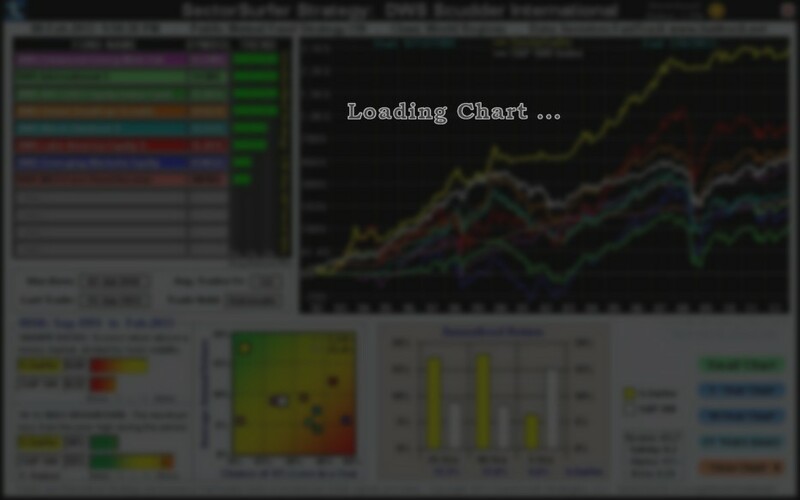 • Portfolio: Asset class diversification: owning multiple funds, each selected by a different asset class strategy. While equity diversification and asset class diversification are well known concepts under Modern Portfolio Theory, they are further augmented in a portfolio by serial diversification to (a) improve returns by selecting only the trend leader from among multiple well-diversified candidate funds, and (b) reduce risk of loss by inherently avoiding trend laggards altogether. We use the terms True Sector Rotation and StormGuard to refer to our serial diversification algorithms that correspondingly select trend leaders and determine when to exit safely to cash as bear markets approach. Serial diversification's performance is determined by trend signal quality. Thus, SectorSurfer was designed to optimally extract trend signals from noisy market data utilizing the cross-disciplinary mathematics of electronic signal processing and matched filter theory, the same mathematics that enables Ethernet, Wi-Fi, and smart phones to perform so well. 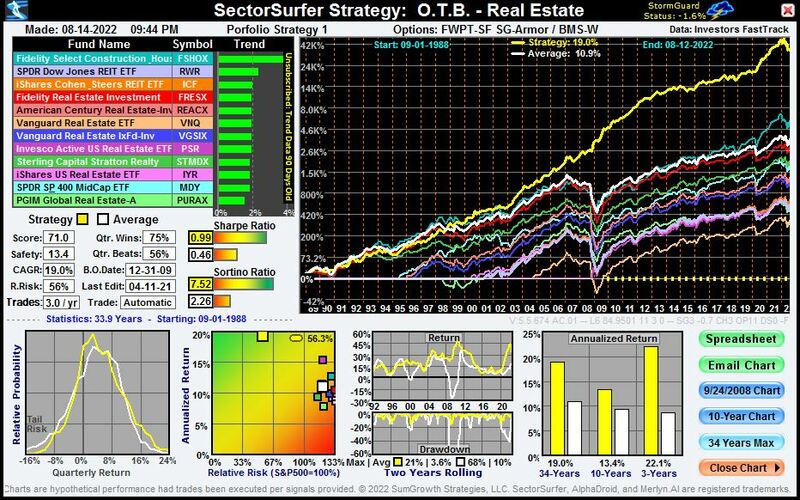 The "Own the Bubble" Portfolio (top chart) holds five diversified asset class Strategies, rebalanced quarterly to their assigned allocation weights. Each Strategy selects the one, and only one, best-of-breed fund in its class to represent the Strategy in the overall Portfolio. The Portfolio holds only those five funds. As indicated above, this Portfolio is intended as an instructional tool for demonstrating how SectorSurfer's algorithms inherently enable one to safely and profitably capitalize on market bubbles as they occur in any market sector. Each of the five underlying asset class strategies is configured with a set of up to 12 funds, each representing a different slice of the asset class or fund management style. 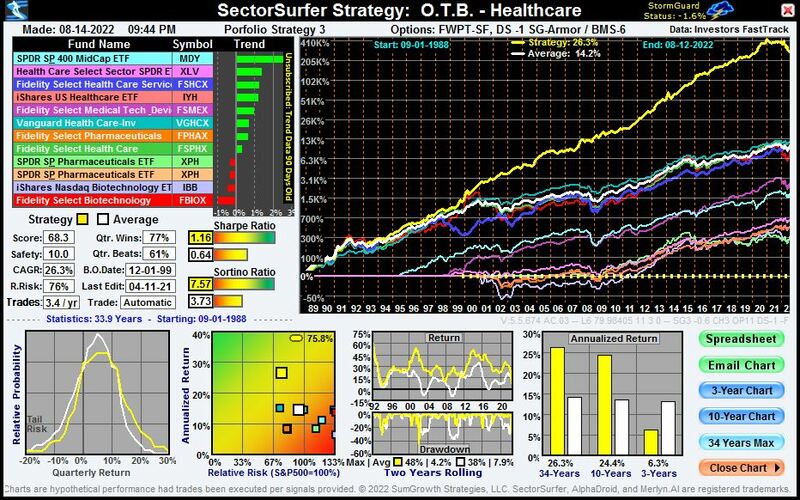 SectorSurfer's algorithms determine which fund is designated best-of-breed based on its trend leadership. The yellow line on each chart plots the performance of the strategy, which owns only the designated best-of-breed fund at any given time. This is True Sector Rotation (or serial diversification) and is a powerful investment ally best appreciated through its performance. Even more impressive is that these strategies incorporate Forward-Walk Progressive Tuning, the industry gold standard for backtesting. Strategies produce only about four trades per year! 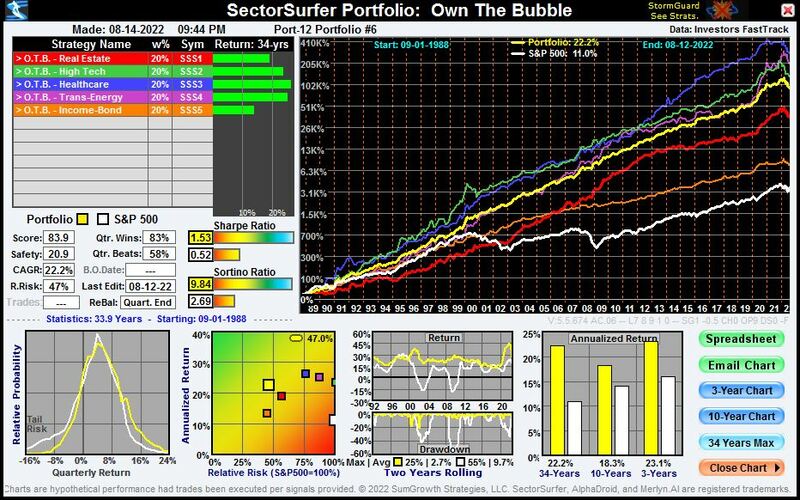 The "Own the Bubble" Portfolio chart plots the performance of each of the contributing strategies with the portfolio's net performance in yellow and the S&P500's performance in white. The overall benefit of Tactical Diversification for this portfolio, relative to the S&P500, includes: (a) 12% higher annualized return, (b) 3.2 times better Sharpe ratio, and (c) only 1/5 the maximum drawdown. This set of Strategies is easily imported into your own account where you can use them directly or edit them to better fit your needs. If you're interested in other fund families or ETFs, start with our Strategy Hall of Fame to view powerful Strategies built by our users. Additional background material can be found in the resource links at the bottom of this page, on the Sector Rotation Theory page, and on the Advanced Topics page. 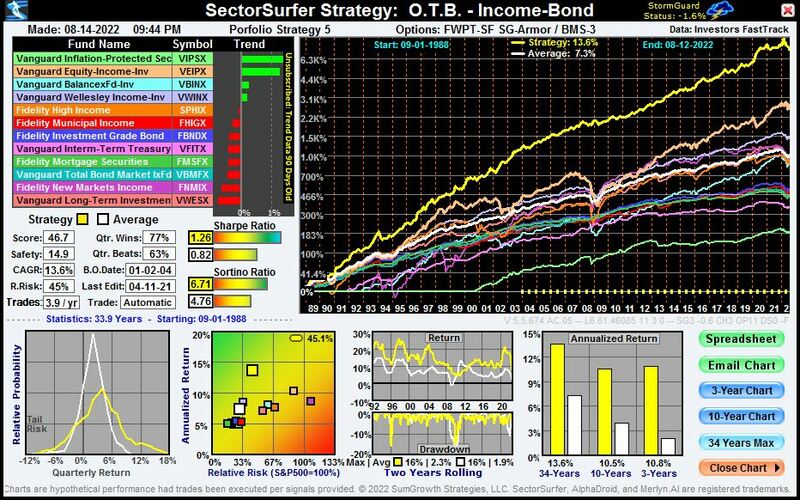 SectorSurfer can put Tactical Diversification to work for you. ... while you go have a life.